Marriott International today announced the opening of the Aloft Dubai South, the Aloft brand's fourth property to open in Dubai this year. Marriott International today announced the opening of the Aloft Dubai South, the Aloft brand's fourth property to open in Dubai this year. Developed by Radar Holdings, the vibrant new hotel is the first to open in Dubai South and will deliver a tech-forward approach and a modern style that is different by design to the bourgeoning business and trade district. Aloft Dubai South is ideally located within the aviation and logistics hub and is also near Dubai's second major airport, Al Maktoum International Airport, and the rapidly expanding Expo 2020 site. 'We are excited to make our entry into the Dubai South district with the opening of a new Aloft hotel," said Alex Kyriakidis, President and Managing Director, Middle East and Africa, Marriott International. "With the ongoing expansion of the Al Maktoum International Airport and the rapidly developing site of Expo 2020, which will see 25 million visitors, Dubai South is the ideal location for a brand like the Aloft which is designed for the hyper-connected, "always on" global traveler." Aditya Rajaram, Managing Director, Radar Holdings commented, "We are very excited to be joining the Dubai South community. We are confident that Aloft Dubai South will be a place that offers a feel-good vibe to guests, while making sure that they have everything they need, when they need it at a great price point." Aloft Dubai South boasts 145 loft-inspired leisurely guestrooms, including six Savvy corner-rooms, featuring modern décor with custom guestroom artwork by Blue Bicycle Design and savvy technology – allowing guests to re-energize and stay connected. All rooms feature the brand's signature offerings, such as an ultra-comfortable plush bed, walk-in shower, custom amenities by Bliss® Spa, fast & free Wi-Fi, and 49-inch LCD TVs, custom USB and universal sockets throughout the room and Google Chromecast that allows guests to stream their own content during their stay. The hotel's dining and social spaces feature Nook, an all-day casual dining outlet serving international cuisine, and the Aloft brand's signature W XYZSM Bar and Re:mix Lounge. 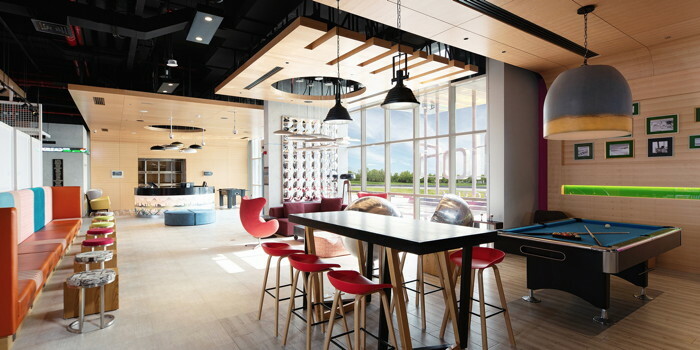 For those on the go, the property offers Re:fuelSM by Aloft, the brand's signature 24/7 grab and go venue, provides light meals, mix-and-match munchies, healthy bites, beverages and more. The hotel will also offer the iconic global Live At Aloft Hotels programming that showcases live acoustic performances by up-and-coming artists. Other facilities at Aloft Dubai South include a 24 hour Re:charge fitness center, an outdoor Splash pool and four Tactic meeting rooms equipped with state-of-the-art A/V equipment and fast and free WiFi. Elaine Watson, General Manager of Aloft Dubai South commented, "We're delighted to announce the official opening of Aloft Dubai South and are excited to watch the area and neighborhoods develop over the next 12 to 18 months. Located just minutes away from Al Maktoum International Airport, we're looking forward to opening our doors and catering to the ever-changing needs of tech-savvy business and leisure guests." Already home to the world's largest logistics and aviation companies, the Dubai South area continues to develop ahead of the start of Expo2020 which will see six months of historic celebrations spread over an area covering 438 hectares. As the first hotel to open in the area, Aloft will establish a firm foothold in one of the region's fast-growing and most exciting neighborhoods.